His remarks came in an address at a Washington conference hosted by the conservative group, Young America's Foundation. 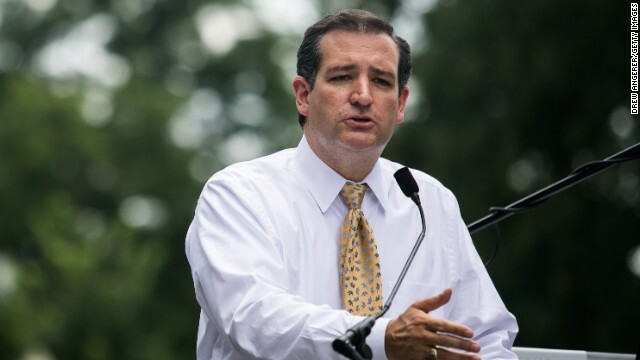 Cruz was a key player in last year’s fight against the law and pushed his colleagues in Congress to try to defund Obamacare ahead of a looming spending deadline. The debate between Republicans and Democrats on the issue eventually resulted in a 16-day government shutdown. Obamacare continued to roll out on January 1 of this year, despite some major hiccups with its website and some of its key provisions being delayed. Cruz, who’s considering a presidential campaign, said the opposition he helped lead last year set in motion an effort that will eventually bring the law down. A CNN/ORC International Poll released last week indicated that more than half the public believes Obamacare has helped either their families or others across the country, although less than one in five Americans say they have personally benefited from the Affordable Care Act. He told the audience that it’s also up to the public to express their discontent with the law. “If we’re going to repeal Obamacare and I’m convinced we’re going to…it’s going to come from the people saying ‘this thing isn’t working’,” he said. And that would be... ... ...? It's hard to express my contempt for Cruz, in polite words. My bet is all or 90% of those who complain about ACA already have healthcare coverage, through employers. Cruz and his family certainly do. I further bet, that if he lost coverage tomorrow on one of his family members that has a preexisting condition, he would enroll them right away. Prior to ACA, that would have been impossible. I know, because of our family situation. If he had an indigent or low income relative, they would be encouraged to take advantage of ACA, whether Medicaid or ACA. To me the best word to describe Cruz and others on the extreme right of the GOP is HYPOCRITE. We Canadians are very happy you guys have Ted Cruz. He would last two seconds up here. The only thing I fear is the stupidity of voting in more Socialist/Communist/Progressives that have financially ruined the country. Washington only knows how to fix problems by throwing money at them and it seems that we now have a majority of voters that want nothing but big government. Your dream of utopia through more government programs and intervention will not work.